Sperm count performed from undiluted specimen. The number of spermatozoa counted in any strip of 10 squares of the grid indicates their concentration in millions/mL. No additional factors are necessary for calculation. The depth of 10 microns eliminates blurring and allows sperm to move freely. The applied sample is observed in one focal plane. The grid is on the cover glass. This eliminates the need to insert a grid into the microscope eye piece and remove it when not required. Reusable. Easily cleaned with a non-bleach disinfectant solution. Observation of color fringes at the four contact points, provides a self-controlled test for accuracy. 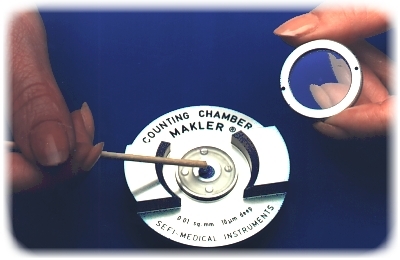 The cover glass can never be raised by the applied sample. Repeated use with complete accuracy without calibration. Manufactured by state-of-the-art precision engineering. Checked individually by laser beam for precision and accuracy.